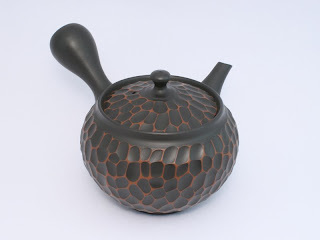 Japanese Hand Craft owner blog: Why choose a Tokoname tea pot? 1. The angle for pouring is a very effective design. 2. Tea does not drip from the spout. The handle is designed for easy handling. 3. The lid shape is adjusted to perfectly match the pot after firing. The excellent match provides a good condition for steaming tea leaves. 4. Impurities adsorb with the fine particle clay. It works as kind of filter and enhances the primary taste of tea. 5. The clay has a lot of iron oxide. The oxide reacts with tannin. Tannin is kind of bitter taste in tea. So if tannin and iron oxide react with each other, the tea teast changes to mild. Tokoname tea pots can make good tea. That's the reason Japanese green tea shops recommend Tokoname tea pots. You can enjoy real green tea taste and fragrance. Are you interested in Tokoname now? I was thinking about buying a tokoname kyusu since the clay enhances fragances of subtil green teas. Is it a waste to drink a scented tea (jasmin tea) in that kind of teapot ? Or will it enhance it too ? What kind of other teas will be ehanced by this teapot ? (red, white, yellow, oolongs, Pu Er) ? I think Tokoname tea pot enhances fragrances of all kinds of tea. But, I recommend one teapot serves one kind of tea. If a tea has strong fragrance, the fragrance would be left inside of teapot. The fragrance spreads to next tea.